This was the very first street-art-piece that I've ever seen in Paris. Back in October 2009, when I was simply strolling around. After all, I've made some research on the web. What I found was pretty surprising, both about "eyes" as about the author. A long full description you can find on The Independent website, so I'll just describe him shortly. He's a young french (French-Tunisian actually) photographer, called JR (he doesn't want to reveal his real name). Quoting The Independent: "The "eyes" on the Ile Saint Louis are the product of a two-year world tour called "Women are Heroes", intended to mark the courage and suffering of women enduring poverty and violence in Brazil, India, Cambodia, Sierra Leone, Sudan, Kenya and Liberia." "By looking into their eyes, you see that they are not just victims but survivors. And now here they are looking out at the people of Paris. When the tourist launches go past at night and illuminate the eyes for just a few seconds, the effect is extraordinary: much better than I could have hoped for." JR is doing well and his artistic achievements still growing. Thanks to Artsy.net we can both read a great amount of the most recent information about him as sight a lot of art pieces. Also, there's possibility of having a quick look into his studio situated somewhere in NY city (to find here). Quoting Artsy.net: "A semi-anonymous street artist of international renown, JR plasters giant, monochrome photographs of faces in urban centers—on rooftops and walls, in church windows, and along the sides of buses. 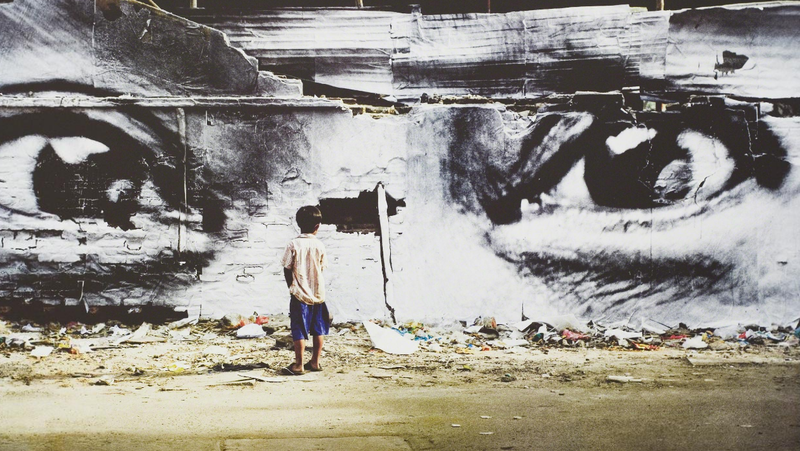 Calling the street his gallery and “using art to turn the world inside out,” JR delivers a message of social action, telling the stories of the marginalized or voiceless."